Rachel Baker is the Lead Engineer at The Wirecutter. Previously she was a Senior Engineer at 10up where she created innovative and scalable solutions for enterprise clients. 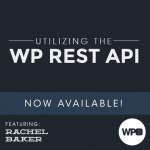 Rachel co-lead’s the WP REST API (WP-API) project and is a contributor to WordPress Core. When away from her computer she enjoys drinking beer, mentoring newbie developers, thinking about returning to her computer, and wearing sweater vests.